UNUSUAL CASE OF A MAXILLARY FIRST INCISOR WITH TWO ROOT CANALS. Janet Kirilova1 , Snezhanka Topalova-Pirinska1, Elitsa G. Deliverska2. Faculty of Dental Medicine, Medical University - Sofia, Bulgaria. Introduction: Maxillary central incisors usually have one root with one root canal. The cases with two root canals are extremely rare. Purpose: The aim was to present an unusual case of a maxillary first incisor with two root canals and the methods of treatment. Material and methods: The 48-year old patient had a painful swelling above the first maxillary incisor. The diagnosis was Periodontitis chronica granulomatosa diffusa exacerbata. After exploration of the pulp chamber, the inspection with an operating microscope was found two root canals. The lesion was covered to periapical and the part of marginal periodontium. The decision was taken of combined endodontic and surgery treatment. Results and discussion: After 7-year follow-up, there was a healing of the lesions and no recurrence. Conclusions: The combined endodontic and surgery treatment was successful choice for preservation of the tooth. Kirilova J, Topalova-Pirinska S, Deliverska EG. Unusual case of a maxillary first incisor with two root canals. J of IMAB. 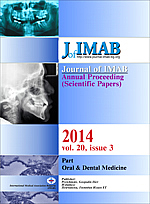 2014 Jul-Sep;20(3):529-532. doi: http://dx.doi.org/10.5272/jimab.2014203.529. 1. Brito-Junior M, Camilo CC, Silva ALF, Sousa-Neto MD. Nonsurgical endodontic management of an unusual taurodont maxillary central incisor: An 18-month follow up. ENDO. 2012 Summer;6 (2):139-42. 3. de Almeida-Gomes F, de Lima Guimarães SNL, Maniglia-Ferreira C, Santos RA, de Vitoriano M, de Sousa BC. Two root canals in maxillary central incisor. RSBO. 2011 Jul;8(3):341-4. 4. Gupta B, Datta P, Datta S S. Management of Double Rooted Maxillary Central Incisor with Two Roots Canals. Indian J Dent Education. 2013 Jan-Mar;6(1):51-3. 9. Todd HW. Maxillary right central incisor with two root canals. J Endod. 1976; 2(8):227.